January 2018 saw Kalbarri SES volunteers busy with several jobs and exercises. After attending an evacuation of a casualty suffering heat exhaustion from Natures Window on January 2, as reported in the last issue, Kalbarri SES volunteers responded to another similar incident several days later however were stood down as upon attendance, St John Ambulance volunteers located the casualty in the car park and no recovery was required. 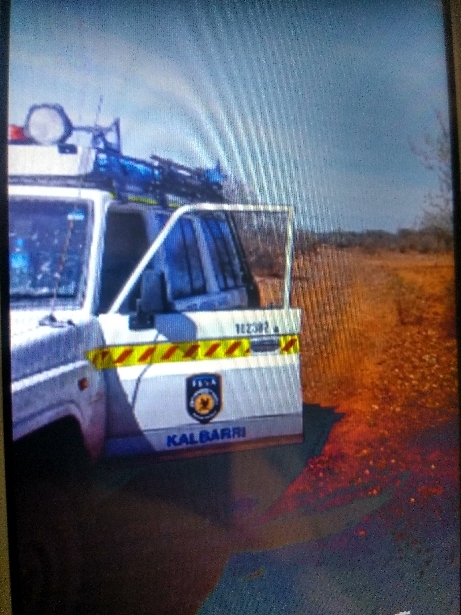 On January 9, 4 Kalbarri SES volunteers travelled 6 hours to Cue to assist with a land search on the following day for a prospector who had failed to return to his camp. After conducting foot and vehicle searches in the area the missing person was sighted from an aircraft several kilometres from his campsite. SES volunteers attended the location and it was confirmed that the prospector was deceased. Kalbarri SES volunteers assisted with recovery of the deceased to a location where he could be transported to Mount Magnet. The Kalbarri crew arrived home late the following day after a long drive home via Murchison Settlement during which they conducted reconnaissance of the area and practiced their navigation skills. While the outcome of this operation was not as we would have liked it is a reality that in outback WA people are very vulnerable to harsh terrain and weather conditions. SES volunteers are trained and ready to deal with outcomes such as this and have access to support networks if required. This incident also again highlights the need for people going into remote areas to be fully prepared for any conditions they may encounter. Life is fragile and can depend on being located quickly. The use of a EPIRB, Spot GPS or other personal location beacon is highly recommended. During recent strong winds Kalbarri SES volunteers attended to a local house where they repaired roofing that had been torn loose by heavy gusts. Luckily there was no major damage and the sheeting was secured and made safe. Kalbarri SES holds training at unit headquarters every 2nd Monday from 1845hrs to 2100hrs. The training is interactive with volunteers responding to various scenarios and developing and practising various responses. All training is accredited and provided at no financial cost to volunteers. Volunteers from Kalbarri SES assisted with setting up for the Canoe & Cray Festival Australia Day celebrations on the Kalbarri Foreshore on January 26. This included setting up tents and the stage and securing the pyrotechnics area. January 27 saw volunteers taking it all down after a very successful day and night of activities. 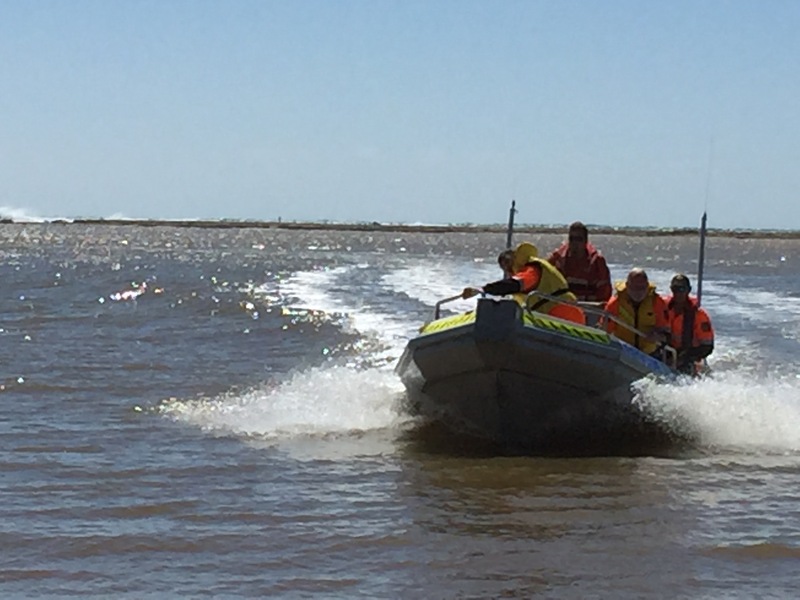 Kalbarri SES joined Volunteer Marine Rescue (VMR), St John Ambulance, Kalbarri Volunteer Fire Brigade and Police in an exercise in the river on Australia Day. The scenario involved 2 people in the water after their boat overturned. 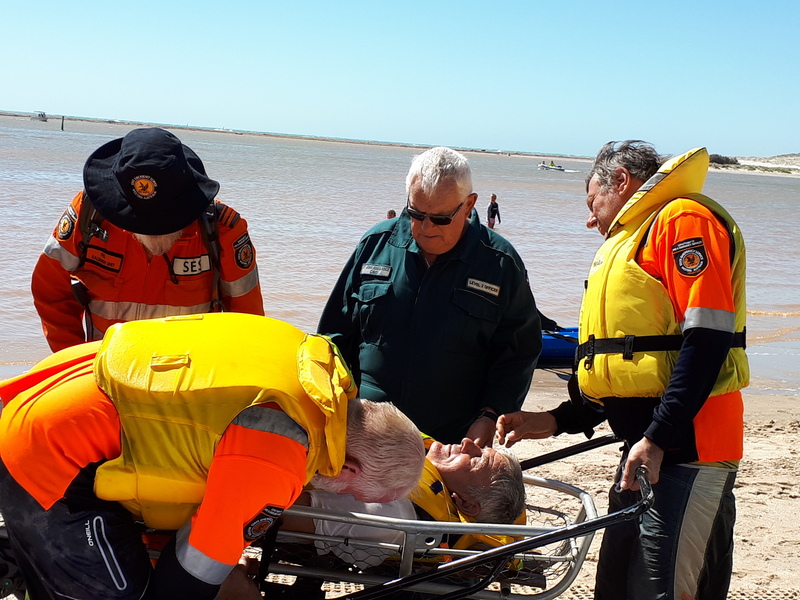 One was rescued by VMR and conveyed to SJA at the floating jetty while the other was rescued by the SES flood boat and conveyed to the beach where he was transferred to the SES mule and wheeled along the beach to an awaiting ambulance. The exercise was watched by a good crowd who were attending the Australia Day festivities. Fortunately all casualties fully recovered and have been referred to attend boat handling and safety courses.